ANAHEIM, Calif. – Nothing else would have seemed appropriate. It took her longer than it ever had before, but Ronda Rousey sent the huge crowd at the Honda Center home happy by submitting Liz Carmouche in the first round with, what else, an arm bar. Rousey won the first women's fight in UFC history by doing what she had done nine previous times, three in the amateurs and six in the professional ranks. Carmouche had Rousey's back at one point and it looked like she may pull off the monumental upset by securing a rear naked choke submission or a neck crank. With the crowd roaring, Rousey dumped Carmouche off her back and then worked relentlessly to get the submission. It came at 4:49 of the first – the latest of Rousey's career – and sent the crowd into a delirium. Rousey was the object of a massive media blitz and was profiled in Time Magazine, on HBO's "Real Sports with Bryant Gumbel" and on CNN – places that normally don't cover mixed martial arts. Rousey, though, did not let it impact her. She came to the cage with a scowl on her face and went out and brutally finished the fight. "No amount of press is going to save these girls from me," said Rousey, a bronze medalist in judo at the 2008 Olympics in Beijing. The bout was 22 seconds longer than Rousey needed to win the Strikeforce bantamweight title about 11 months ago when she submitted Miesha Tate. Then, Rousey was largely an unknown commodity at the one of the highest levels of MMA. This time around, she was the big star and handled the pressure with the aplomb of a 10-year veteran. She landed a punch early that backed Carmouche to the cage and immediately tried for a throw to get the takedown. Carmouche fought it off and eventually got Rousey's back. But after Rousey got her down, she went into side control and pounded Carmouche's face with punches. When she saw the opening, she wrapped her legs around the arm and the crowd, sensing the finish, roared. 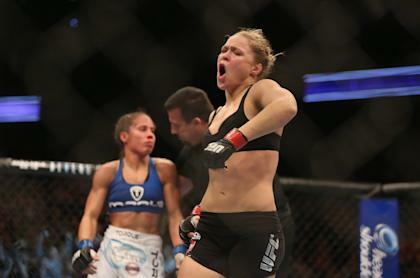 Rousey leaned back and cranked, pulling off the historic win. In the co-main event, Lyoto Machida earned a shot at the UFC light heavyweight title with a split decision victory over veteran Dan Henderson. Machida was unwilling to engage with Henderson, much to the crowd's consternation, and he simply circled and countered all night. There weren't a lot of clean shots landed by either fighter, but Machida seemed to score more with the counters in the second half of the fight. Machida's quickness was the difference in the fight. He circled and moved the entire fight, not willing to stand and trade with Henderson or risk being taken down. The result was an unsatisfying fight that left many in the large crowd booing loudly. Henderson was clearly the crowd favorite, and it roared at everything he landed. But Henderson wasn't able to get the fight into a confined space. Even when he got top position in the second, he was unable to score much. "I'm sorry the fight wasn't as good as the fans wanted," Machida said. "My strategy was to keep away from the right hand and to keep the fight standing up. I thought I won the fight because I frustrated him and kept the fight where I wanted it. I hope I am now the No. 1 contender. I want a title shot." Henderson, not surprisingly, had a different view. "I won the fight, but not officially," he said. "I hit him whenever he wanted to fight. He ran away most of the time. I thought I won."